"I Wish That I Could Fly"
Whites Creek Pike is the third album I have made with producer Mark Moseley in Nashville, Tennessee. As before I have written all the songs and, with a total of 17 tracks, it is certainly my most extensive album. In approaching this project I decided this time to put the song first. That meant abandoning my previous adherence to a bluegrass and acoustic style and allowing a wider mix of instruments, including piano, electric guitar, pedal steel guitar, saxophone and drums; basically whatever would suit the song. There is still a something of an acoustic feel to the album as a consequence of having acoustic guitar, mandolin, banjo and fiddle, but the general flavour is quite varied. Some tracks have a traditional country feel, some are distinctly jazzy, some reveal an Irish influence and some pay homage to a 1950s style. My drummer on this album was Tommy Wells. Tommy was one of Nashville’s most admired musicians and it shocked everyone when, just one week after recording this album, quite unexpectedly he died of an aneurism. I therefore decided to dedicate the album to Tommy who, apart from being a great drummer, was such fun to be with. I have released several tracks from this album on the European “Hotdisc”, including “You Really Are An Angel”, “What’s Good For You” and “How I Only Wish That I Could Fly”, which have all been well received and spent several weeks in the top ten. I was very fortunate to be able to record the second release with Carolyn Martin. Carolyn, who is unquestionably the leading female Western Swing singer in the US. She is a great singer and would complement any album. The band was really a collection of virtuoso session musicians who, between them, have probably played and recorded with just about every country star in Nashville. I thank all of them for their great contributions to this album. 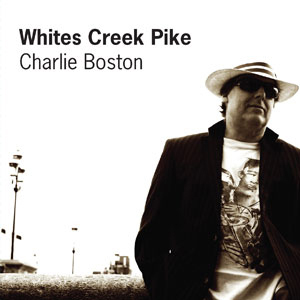 'Mr Reliable, Charlie Boston writes a good country song and always produces music rich in fine acoustic fiddle, Dobro, mandolin etc. always sounds good to my ears." "Another good song from one of the UK’s finest current acts." London born Charlie Boston is quite unique in British Country Music. “Whites Creek Pike” (Lara) is his sixth album of original self-penned material. Quite a feat. The 17 track album was produced by Mark Mosely in Nashville. Charlie has quite a variety of styles on the album, from the up-tempo opening track, “You Really Are An Angel” to the folky “Carry My Heartaches Away” and “Please Don’t Turn Me Away”, and the Bluegrass tinged “I Wish I Could Fly” to the more big band “Michael Sneaky Pete Burton”, a tribute to the late Somerset musician. “Trade With The Devil” is a catchy up-tempo number, whilst he slows it down on tracks like “Your Love Will Hold Me”. “Why Cant You Love Me” has quite a soft gospel feel to it, whilst “Train Bound For Nowhere” has an old time Country feel to it. “What’s Good For You” is a duet with Texan Carolyn Martin. I really enjoyed the album. A lot of different styles. Charlie’s vocals aren’t the strongest, but he knows how to deliver his songs , Well worth a listen. An eclectic mix of songs and styles lumped together under the catch-all banner of country music, although to be fair Charlie is quoted in the press kit as preferring the folk side of country music “where instruments like mandolins ad fiddles can play a part”. Consequently there is a noticeable bluegrass influence. I felt quite a few of the lyrics, particularly in tracks like Michael “Sneaky Pete” Burton, a tribute to a fellow musician who passed away in 2011, have an engaging story telling abaility in the Tom T Hall style. No bad thing in my book. You Really Are An Angel gets us off to a promising start. It’s well packaged, the song writing is more than competent and you can’t fault the value for money of seventeen tracks.